Navigating Senior Care Options. 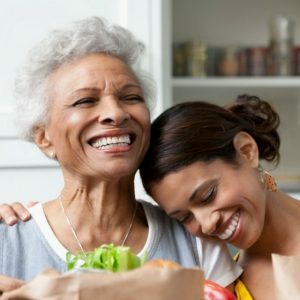 What's Best for Mom? By the year 2020, 56 million Americans will be 65 and older. Many adult children can attest to this – most elderly would prefer to age at home. In fact, 90% of people aged 65+ want to stay in their homes for as long as possible. And 80% think their current home is where they will always live. However, remaining at home might not always be the right option for your aging parent. There are many senior care options for Mom. Do you know what’s best? Finding senior care options can be complex and confusing. Many seniors, as well as their adult daughters or sons, are unaware of the different possibilities and may not know what’s best. Furthermore, senior care options have evolved significantly over the years, offering many more choices for different levels of care. Do you know what’s best for Mom? There may not be an easy, clear answer. Here is an overview of some common senior care options to help you navigate the choices and determine the ideal level of care for your parent. Independent Living Communities may be the answer. This option helps seniors who need a bit of assistance from time to time, and could offer amenities such as light housekeeping and laundry. It also may feature different housing options designed to meet the needs of seniors as their needs change. Some communities have assisted living accommodations for residents who may have a greater need for care in the future. Assistance with eating, bathing, dressing, etc. Assisted Living Facilities are a great option for seniors who want or need help with some of the activities of daily living, such as cooking meals, getting to the bathroom in the middle of the night and transportation to and from appointments. These facilities offer safety and security, while also promoting privacy and independence. Shared dining and recreational areas encourage socializing with other seniors. And assistance is always just a phone call away. However, many parents find the idea of moving to an assisted living facility to be depressing and just one step away from losing their independence. If it turns out to be the best option, how do you go about convincing your parent that it’s time think about moving to assisted living? Read this piece for advice. A Nursing Home might be the best option. Nursing homes differ from other senior housing facilities in that they provide a high level of medical care. Experienced personnel, including physicians and nurses, are on staff. Other medical professionals, such as occupational or physical therapists are also available, allowing delivery of medical procedures and therapies on site. Non-Medical Home Care fills the gap between people needing medically skilled services and people who need non-medical companionship and help around the house. Home care offers companion care and personal care services to help seniors maintain their freedom and independence. A wide range of companion care services can be offered at home, in the hospital or in healthcare facility settings, and personal care services can assist with the activities of daily living. FirstLight Home Care provides other senior care services such as dementia care, hospital readmission rescue, travel companion services, as well as respite care to give family caregivers temporary relief from caring for a loved one. Find a FirstLight Home Care near you.